From the 16th to the 19th of October, employee-volunteers from all across York got together to make a difference in the city. They gave up their time to help out four very different community organisations from all across York. 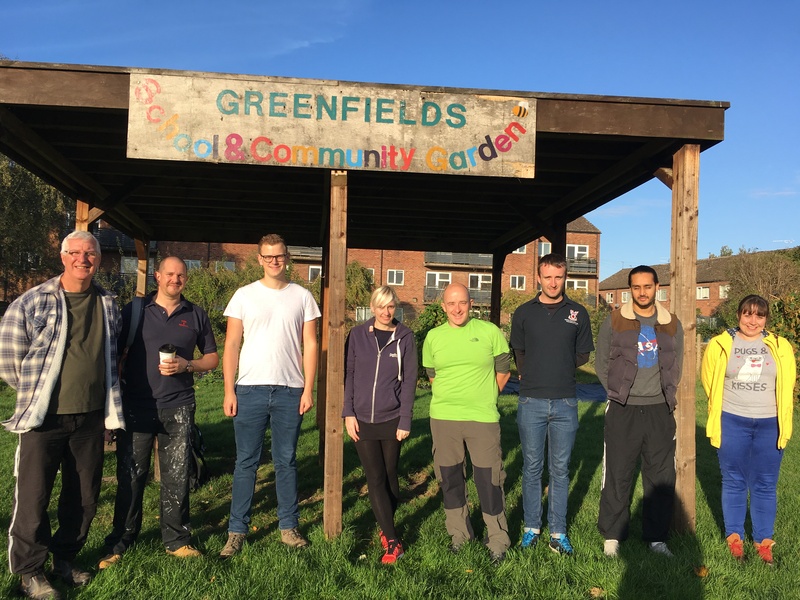 Teams from the Partners Group and Lendlease headed to Bell Farm Social Hall on Monday to give this community hub a new look with a fresh coat of exterior paint. Bell Farm runs a range of community activities and services through the combined efforts of the local residents association and community centre volunteers. Over the summer, they planted a beautiful community fruit and veg garden. Thanks to the efforts of the employee-volunteers, the new look exterior of the Bell Farm Social Hall reflects the amazing work going on inside. On Tuesday, teams from John Lewis, TSP and Aviva cleared up pathways to increase accessibility in Hull Road Park. The work that was undertaken in the park was a continuation on from our Big Community Challenge 2016 in preparation for the hotly anticipated community café that is going to be built in the park. We were lucky on Wednesday to have some sunshine, as well as local broadcaster ‘That’s York’ come to say hello to our teams. The interview can be found here. 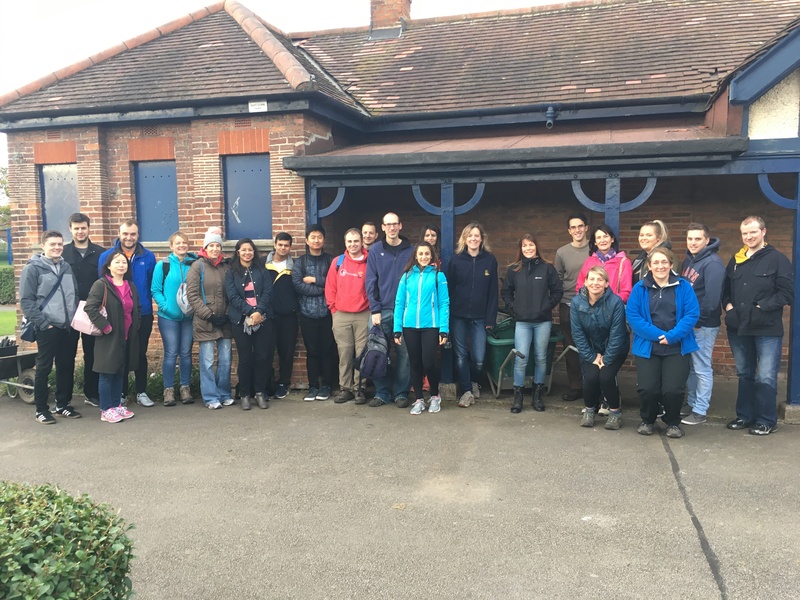 We had teams from Nestle, TSP, Benenden, as well as students from University of York helping out in the Greenfields Community Garden. They were able to make a difference to the project by lending a hand in their quest to build and fill a leaf mulcher. 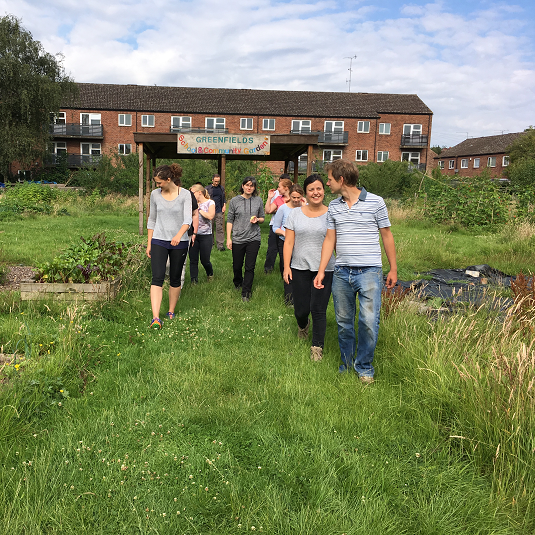 As Greenfields volunteers explained on the day, the Garden is on poor soil so their success depends greatly on the ability to create their own compost. On Thursday, our luck with the weather ran out and the heavens opened. This wasn’t enough to deter our intrepid teams of employee-volunteers from Portakabin and Aviva. They were stationed in Danesgate Community Walled Gardens and were all smiles in spite of the terrible weather. On the day, Aviva employee-volunteer Kim Reay has this to say: “It’s a great team building event for us. It’s nice to get into a different environment, outside of an office environment. You’ve got something tangible; you can see how you’ve actually helped at the end of the day. 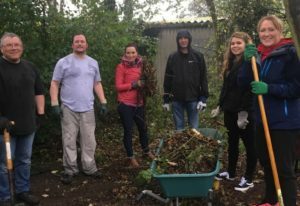 It’s really good fun and it’s nice to give a little something back.” The teams created woodland pathways and helped to repair raised beds. 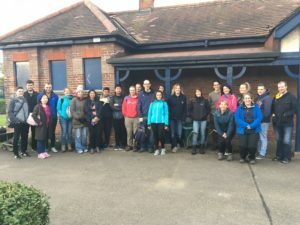 Over the week employee-volunteers were able to make a difference, try something new, get outside and have fun whilst doing it – can a Team Challenge Week get any better? Let’s find out in 2018! Team Challenge Week 2018 will be taking place on the 15-19th of October. Volunteer recruitment begins this September. If you are a community or voluntary organisation who would like an extra boost of volunteer support this Autumn, contact us at info@yorkcares.co.uk.